Climate change is affecting coastal ecosystems globally, with severe implications for developing countries that are heavily reliant on their natural resources for economic growth. In Belize, coral reefs, mangroves and beaches are the cornerstone of the tourism industry, while coastal communities rely on mangrove- and reef-based fisheries for food and income. The growth of the tourism industry is viewed as essential to the country’s economic development, but this growth is often accompanied by habitat degradation that directly threatens the resources upon which the industry depends. The challenge faced by decision-makers is how best to develop the tourism sector while maintaining healthy, functioning coastal ecosystems that support the industry, sustain people’s livelihoods and provide the coastline with natural resilience to climate change. This CDKN-supported project* aimed to inform decision-makers by assessing the vulnerability of Belize’s tourism sector to climate change, including the coastal ecosystems on which it depends and its essential infrastructure. This project — which aimed to determine the climate vulnerability of coastal Belize and propose solutions to climate-related threats — involved consultations and collaborations with local communities, privately owned tourism businesses and the government. *Download from the right-hand column. Key sections of this CDKN Inside Story are summarised bgelow. See the full text for more detail and additional information. Identify the most vulnerable coastal tourism areas that should be prioritised for adaptation action. Determine the key policy instruments that support or hinder Belize’s ability to make progress in achieving climate compatible development, and where gaps exist. Identify and prioritise the policy reforms and adaptation strategies for integration into national policy. The project analysed existing development policies and adaptation options to identify any gaps and areas where these could be strengthened. This provided strong sociocultural and economic justification for stakeholders, local communities and the national government to place more emphasis on conserving and restoring natural ecosystems, and implement better coastal-zoning and development- planning practices. The project team then invested time in reaching out to the targeted stakeholder groups that were in a position to implement the findings. These included representatives of the tourism and fisheries industries, local communities and government decision-makers. For these groups, information was provided in simple language, using graphics and photo stories to demonstrate the environmental and economic benefits of the proposed green approaches. Project information and outputs were also shared via the University of Belize’s Environmental Research Institute’s free, online data portal and the WWF website. Adaptation options identified through the project were proposed for inclusion within national-level initiatives via Belize’s National Climate Change Office. This office is currently finalising the national climate change policy, strategy and action plan for Belize. Short project timeframes and limited funding: For a project to be successful, stakeholders (e.g. land owners, private sector tourism groups, the government and local communities) needed to be fully engaged during and after the project. However, in this instance, the short project time frame (18 months) and limited funding hampered the ability of the project team to engage continually with communities and stakeholders. This reduced the effectiveness of efforts to establish long-term trust and buy-in for recommended adaptation activities. Disseminating information: Throughout the project, it was a challenge to garner high turnouts at community consultations, and the team had to reschedule meetings and outreach initiatives to ensure that stakeholders were available to provide inputs. To this end, the team built partnerships with local non-governmental organisations and grassroots community groups to assist with the dissemination of project information and outputs to stakeholders. Data availability and collection: The collection of the required data (e.g. sourcing critical datasets for the vulnerability assessment) was complex, challenging and time-consuming. The project team intended to use up-to-date and robust national datasets on ecosystem services, climate variables and projections, and socioeconomic information of critical relevance to Belize’s tourism sector, economic stability and growth. Unfortunately, as is common with climate information, national decision-makers and researchers in Belize tend to use global information and projections, due to the lack of downscaled datasets. Also, analysis of climate impacts should include data on historic climate trends, but these are not comprehensive or readily available for Belize. As a result, the best-available information was used. This included a mixture of data from global climate projections, national historic climate trends analysis and local knowledge. Using local knowledge, which included traditional knowledge and data from locally based socioeconomic and ecological research, was possible as a result of the participation of communities and other local stakeholders. This was very important, since these groups play a two-part role: they hold information that is not otherwise available, and they are the actors that need to be informed in order implement the recommended actions. The project was successful due to a combination of factors. Supporting stakeholders to use climate information: The use of climate scenarios and graphics played a critical role in raising awareness and engaging communities and stakeholders on the need to implement adaptation best practices. However, it is not enough just to make scenarios and information available; they must be accompanied by ongoing guidance and support to ensure widespread and appropriate uptake. Dialogue between those providing information and the communities and stakeholders using it is vital. For example, this helps to manage expectations of what science can effectively deliver. Forging partnerships: Working in partnership and building sustained relationships with local entities opened doors to influence better practice on the ground. This was very important, since these entities play important roles as advocates, sponsors, partners and agents of change. Where there is trust – between the project team, the communities involved and the stakeholders targeted by the project – communication was found to be very effective. The project used visual techniques including an interactive map to raise these groups’ awareness of climate vulnerability and to deliberate solutions collectively, which included embracing ‘grey-green’ infrastructure to guard against coastal erosion and flooding. Involving all these stakeholders encouraged buy-in and the uptake of adaptation actions, notably the Government of Belize’s decision in February 2016 to adopt an integrated coastal zone management policy and related subnational action plans. Mainstreaming climate change adaptation strategies within national policies and sectoral plans, alongside sound development planning, can lead to maximum returns. As a result of the action research and engagement process, the Government of Belize has adopted several new policies and plans, and is revising outdated ones. This can be partly attributed to the project’s activities. 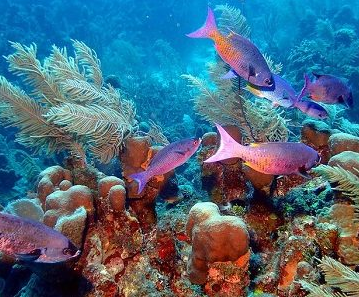 For example, the Belize Coastal Zone Management Authority and Institute recently developed a national integrated coastal zone management plan for Belize, with support from the World Wildlife Fund (WWF). This plan aims to ensure the sustainable use of coastal resources by balancing conservation ideals with the country’s economic and social needs. The Government of Belize adopted this plan in February 2016 and has adopted a further nine regional development guidelines for Belize’s coast to accompany the plan. The Government of Belize is also planning to revise national mangrove regulations to grant greater protection to mangroves and reflect the critical goods and services provided by these ecosystems in buffering against climate impacts. Alongside this, efforts are underway to revise the Belize coastal zone management act to grant greater protection to Belize’s coastal habitats, including those beyond the high-water mark, as well as to ensure that it is sufficiently ‘climate smart’ to address the future risks and vulnerabilities posed by a changing climate. As Belize develops its National Adaptation Plan and looks to integrate adaptation considerations in sectoral planning, this project serves as a good example of how to balance the tourism sector with responsible coastal management that considers potential climate change threats. Nadia Bood and Marianne Fish, World Wildlife Fund; Chantalle Clarke-Samuels and Maritza Canto, Coastal Zone Management Authority and Institute; Leandra Cho-Ricketts, University of Belize’s Environmental Research Institute. Bood, N., Fish, M., Clarke-Samuels, C., Canto, M. and Cho-Ricketts, L. (2016) Opportunities for climate compatible coastal tourism – Lessons from Belize. CDKN Inside Story. Climate and Development Knowledge Network: London, UK.